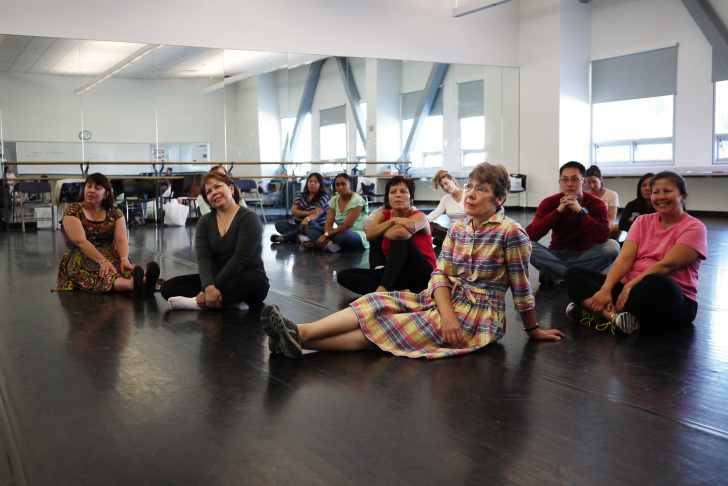 Mary Plummer/KPCC | A group of LAUSD teachers at an arts training program at Cortines high school in June. July 31st, 2013, 5:26pm :: Kim Bruno, head of New York's famous LaGuardia Arts high school will be the fifth principal in five years to take the helm of Cortines high school, a combined campus that includes a large performing arts program. "We are very excited to bring in an accomplished arts educator who's been recognized nationally," said Instructional Superintendent Tommy Chang, who oversees the school for the district. Chang praised Bruno for her strength in integrating the arts into successful academic programs in the past. She'll arrive in Los Angeles next week. A few dozen candidates applied for the positions, and about ten were interviewed during a two-day process last week, according to Chang. Bruno, who did not respond to requests for comment, was selected as the top choice this week. "Kim Bruno was the resounding favorite of the committee," Chang said, adding that he's optimistic she'll be at the school for the long haul. Bruno had applied and been considered for the job twice before as the district struggled to recruit the right leader. She follows interim principal William Webb, who took over following Principal Norm Isaacs resignation June 10. Bruno reportedly has been successful at fundraising in New York, which could help Cortines. The school has struggled to find the funds for maintenance and upkeep of the large and expensive campus, which includes dance classrooms, a 950-seat theater and a swimming pool. The school cost $232 million to build. Despite the unstable leadership, the school's students have had some notable successes. Student Mason Park, who graduated Cortines last Spring, was one of 20 high school seniors across the country selected as a U.S. Presidential Scholar. The school also performed well at the The Jerry Herman high school musical theater awards, which took place in May at the Pantages.